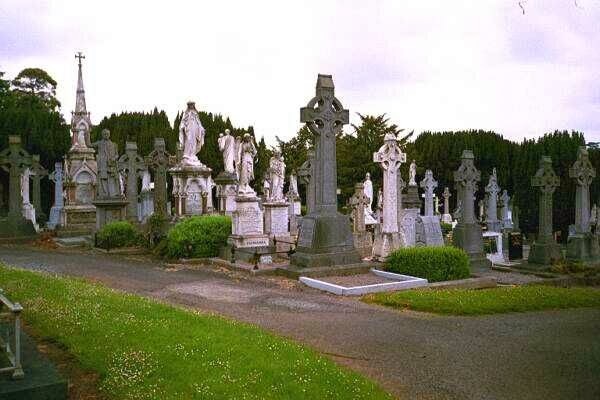 Glasnevin Cemetery was established in 1832 under the direction of Daniel O’Connell for the purpose of burying “people of all religions and non”. The Glasnevin cemetery encompasses 124 acres and 1.5 million burials. It has a great national heritage through the social and historical history of the people buried there from all walks of life over 178 years. Famous people interred there include the founder of the Cemetery - Daniel O’Connell, Charles Stewart Parnell, O’Donovan Rossa, Eamon De Valera, Michael Collins, Countess Markiewicz, Maud Gonne McBride, Gerard Manley Hopkins, Brendan Behan, Christy Brown, Jimmy O’Dea, Luke Kelly, Alfred Chester Beatty, Michael Cusack and Liam Whelan. Less acclaimed people include victims of the Great Famine, the Cholera outbreaks and the Air India crash as well as the babies in the old Angels plot which was renovated and inaugurated by Presi dent McAleese in 2005. The new Angels plot (1970 to present day) is currently undergoing renovation. The Cemetery’s most famous architectural feature is the 51 meters high O’Connell Tower, designed by George Petries and made of Wicklow granite, where the remains of Daniel O’Connell are interred in a family crypt directly below the tower. It is the highest round tower in Ireland. The crypt and tower have recently been restored in conjunction with the OPW and are open to the public for the first time since 1970. The Mortuary Chapel, designed in the 1870s, is appointed with stone carvings by James Pearse (father of Padraig and Willie).